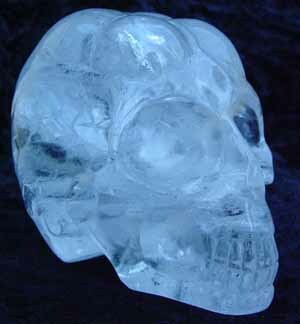 Crystal skulls are a metaphor that reality is a consciousness hologram through which we experience virtually. 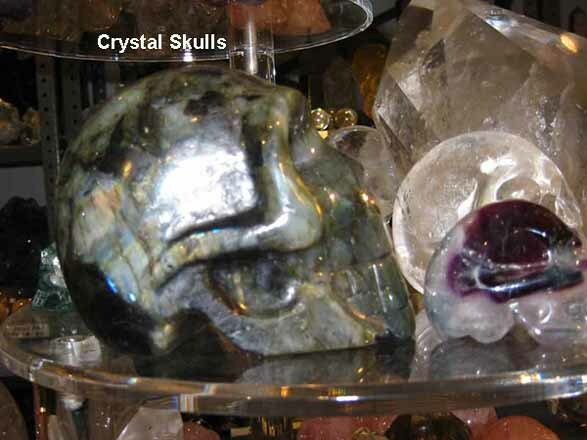 Many of the s=crystal skulls are tools that awaken human consciousness, referenced by the human brain design of the crystal and the metaphoric eyes. If you are reading this file, your soul is searching, in these prophetic times, for answers to the great mysteries of life ... death ... and rebirth. Many crystal skulls are designed at specific angles representing a union of sacred geometry and the nature of the quartz crystal used. 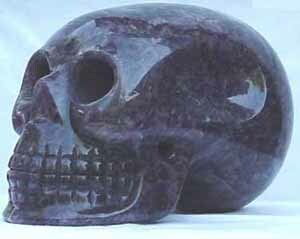 In metaphysics, crystal skulls are used for ceremonial work, healing, energy work, and enhancing one's psychic abilities. Used for healing, we go to themes of self awareness and creating balance to opening psychic abilities to be able to understand the nature of human creation and evolution. Holding an object to exchange energies and/or receive messages with it, is called psychometry. To find messages while look at the inclusions within a quartz crystal, or crystal skull, is a form of divination called Scrying. 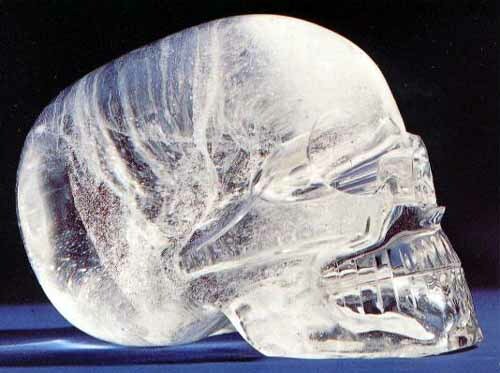 There are countless hypotheses that the crystal skulls are the legacy of some higher intelligence or ancient astronauts who seeded the human race. 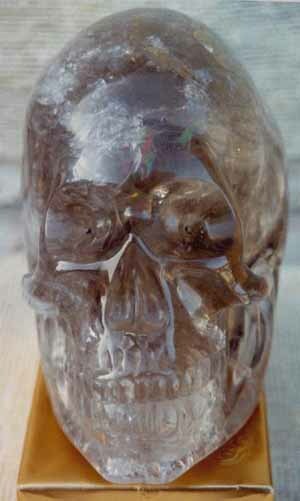 The most widely celebrated and mysterious crystal skull is the Mitchell-Hedges Skull, for at least two reasons. First, it is very similar in form to an actual human skull, even featuring a fitted removable jawbone. 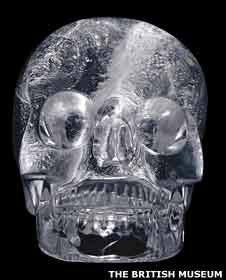 Most known crystal skulls are of a more stylized structure, often with unrealistic features and teeth that are simply etched onto a single skull piece. 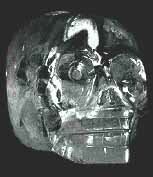 Second, it is impossible to say how the Mitchell-Hedges skull was constructed. From a technical standpoint, it appears to be an impossible object which today's most talented sculptors and engineers would be unable to duplicate. 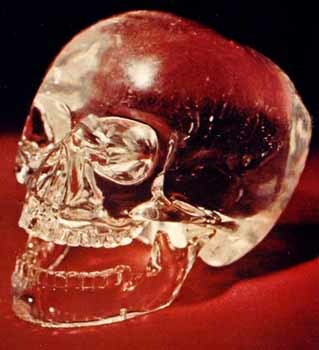 The discovery of the Mitchell-Hedges crystal skull, sometimes referred to as the "Skull of Doom", is a controversial matter, and reads like a sci-fi action adventure film. The skull was made from a single, unusually large block of clear quartz crystal, and measured 5 inches high, 7 inches long, and 5 inches wide, weighing 11 pounds, 7 ounces. It closely corresponds in size to a small human cranium, with near perfect detail, even to rendering the skull without the globular prominence or superciliary ridges, which are characteristics of a female. As the story goes ... One day in 1927, English adventurer, traveler, and writer, F.A. "Mike" Mitchell-Hedges, who had a talent for telling colorful stories, was clearing debris from atop a ruined temple at the ancient Mayan city of Lubaantum, located in British Honduras, now Belize. His seventeen-year old daughter Anna, who had accompanied him, suddenly saw something shimmering in the dust below. 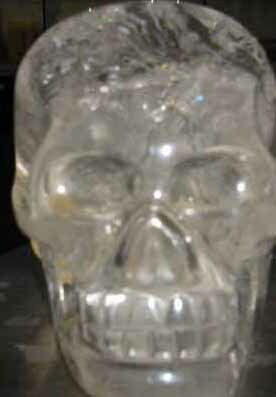 Anna found an exquisitely carved and polished skull made of rock crystal, with the jaw piece missing. Three months later, she located the jaw in an excavation about 25 feet from the first site. 13 takes us to the closure of our biogenetic experiment at this level of reality, created in linear time to understand emotions. December 21, 2012 is allegedly the time for the evolution of consciousness foretold in all prophecies, when humanity awakens and souls return to 'source' as this program closes. In third dimension, there will always be 12 or 3. 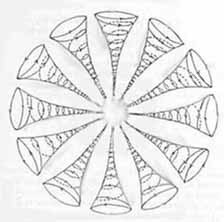 Taken further we have the Fibonacci Sequence, published in 1202, and further on to the patterns of sacred geometry that explain the movement of human consciousness through time. There are allegedly 12 pyramids or 12 portals, or 12 major power points on the Earth grid that are strategically placed and will activate when consciousness reaches Zero Point - reversed Fibonacci to zero. Some also see 12 UFO's buried in the beginning, that will rise at the end of time. There are many theories about 13 crystals skulls that will come together soon, as human consciousness remembers its soul's purpose and all evolves in the alchemy of time. 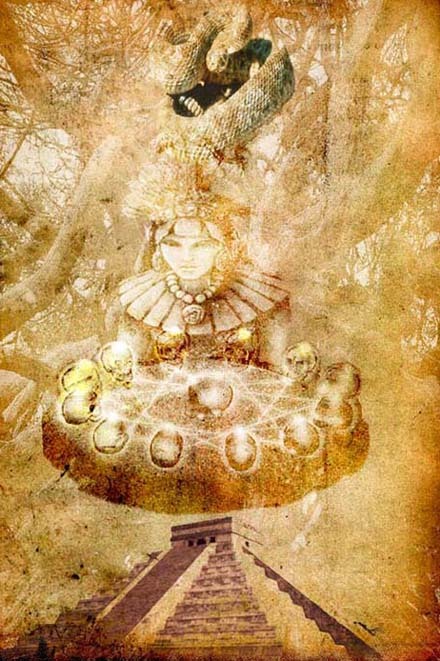 13 crystal skulls were left behind by a sophisticated Hollow Earth society who left thirteen "master skulls" which contain around the planet the history of these people, their relationship to our creation, and the future of humanity. 13 crystal skulls were left behind thousands of years ago, by ancient Mayan elders, to be found by future generations. These skulls are containers of great knowledge and wisdom holding information about the history of the planet, the evolution of mankind, and above all, our purpose on this Earth and our future destiny. The legend says that one day, at a time of great crises, all of the 13 crystal skulls will be discovered and reunited. When that time comes the information will be divulged to humanity, who will be ready to understand it. 13 life-size crystal skulls scattered throughout the planet that will one day be brought together, forming a grid matrix that will allow human consciousness to evolve and return to its natural state of light. Some of the skulls are allegedly in the hands of indigenous people, shaman perhaps, who are custodians of the artifacts, while other crystal skulls remain in the hands of those who are not yet aware of their importance. 12 people, along with their crystal skulls, will be guided to a specific place, when the time is right, most likely the Yucatan. No one seems to know exactly when or where that will, though the time feels soon. The location of the 13th skull is most likely unknown at this time. Theories abound from a link to extraterrestrials, to buried beneath the ground, to it will manifest when time is resequenced, to being hidden by ancient Mayan elders. 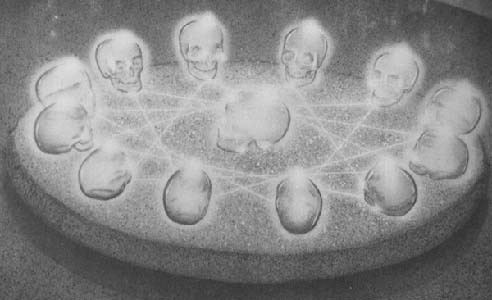 When placed together, the crystal skulls will form a grid matrix (reality is a consciousness holographic matrix) aligned with the 13th skull, allowing human consciousness to ascend (return) to its natural state of being, light. The snake in this image references the spiraling movement of human consciousness and DNA -- Reptilian Connections -- Sumerian Gods creating a biogenetic experiment. Crystal skulls are primarily linked to the ancient Mayans as so many skulls are found in Mesoamerica. The Maya take us to Quetzalcoatl and the Mayan Calendar prophecy of December 21, 2102 as an end time date for the programmed reality in which we experience at this level of conscious awareness. December 21, 2012: The Long Count calendar used by the Maya civilization of pre-Columbian Mesoamerica completes its thirteenth b'ak'tun cycle since the calendar's mythical starting point (equivalent to 3114 BCE August 11 in the proleptic Gregorian calendar, according to the "GMT-correlation" JDN= 584283). The Long Count b'ak'tun date of this starting point (13.0.0.0.0.0) (13=4) is repeated, for the first time in a span of approximately 5,125 (13=4) solar years. The significance of this period-ending to the pre-Columbian Maya themselves is unclear, and there is only a single known but incomplete inscription (Tortuguero Stela 6) which records this date. However, it is conjectured that this may represent in the Maya belief system a transition from the current Creation world into the next. A number of modern synchretisms and "New Age" theories co-opt this period-ending into their own speculations on the meaning of this "ending" of a Maya calendar cycle. The December solstice for 2012 also occurs on this day; to the majority of Mayanist scholars this is seen as no more than a coincidence, and the Maya did not deliberately devise their calendar so that this period would end on a solstice point. Jane is the owner of a crystal skull named Maya, which she purchased in Mexico in the 1990s and uses as a tool for healing and psychic work. In September 1995 -- 12 psychics from around the world gathered at my home in Brooklyn by the Verrazano Bridge to work with crystal skulls. The following day, Jane and I joined Joshua Shapiro, co-author of Mystery of the Ancient Crystal Skulls for a crystal skull workshop in Manhattan. 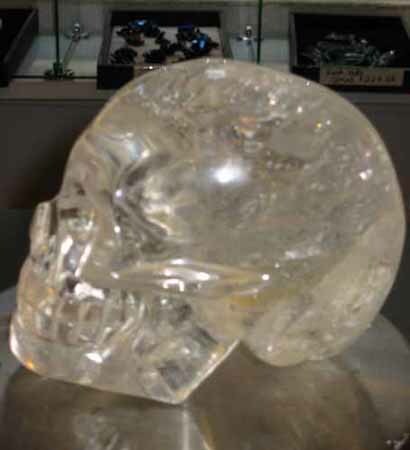 Alleged facts about Max: Max is an authentic ancient crystal skull estimated to be many thousands of years old and considered one of the rarest artifacts ever found. Max was used by Mayan priests for healing, rituals, and prayers. Lama Norbu, a powerful healer, came into the presence of Max in Guatemala and was given this precious skull when he left the Mayans. 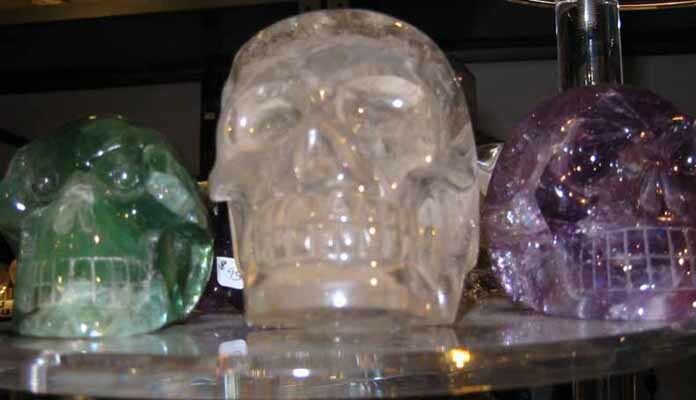 He took him to Houston, Texas, where the crystal skull sat on his altar as a healing tool. JoAnn and Carl Parks met Norbu when their twelve year old daughter was dying of bone cancer. JoAnn then worked for the Lama for many years. Before Norbu died, he gave the cherished crystal skull to the Parks with no explanation but that someday they would know what it was all about. 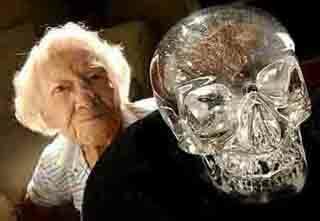 JoAnn didn't know what to do with the crystal skull so she placed it in a box in her closet for many years. 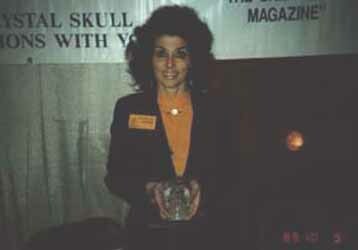 In 1987, a TV show led her to Nick Nocerino, co-author of Mystery of the Ancient Crystal Skulls. Through Nick, as it is with all things here to awaken human consciousness, Max became famous nationally and internationally. 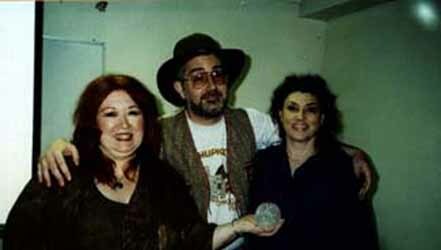 My first experience with a crystal skull was in 1989 at the Whole Life Expo in New York City, where I met Max. What I experienced, was strong energy and messages from Max and others who had held him and connected their grid with his. The British Crystal Skull is currently residing in the British Museum of Mankind in London and has been there since 1898. 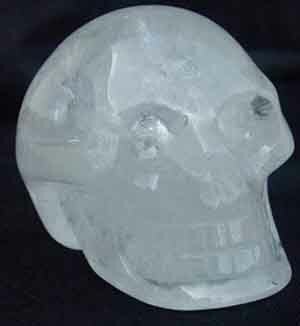 It is a one-piece clear quartz full size crystal skull. The Paris Crystal Skull currently resides in the Trocadero Museum in Paris, France. 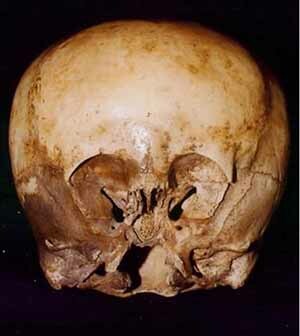 It has a slight indentation (hole) on the top, that was cut into the skull purported to hold a something. 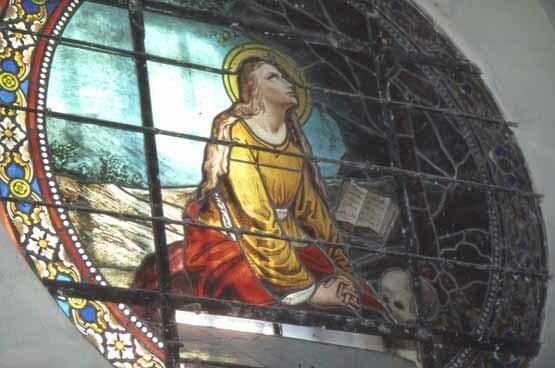 The public first became aware of the crystal skulls during the later part of the 19th century. At this time, many museums of the world became interested in displaying antiquities from past civilizations , Egypt, Greece, Mesoamerica, etc. Thus, in the 1878, in the Mus�e de l'homme (Museum of Man in Paris) and in 1898, in the Museum of Man of London, each had a clear quartz skull on display (both came out during the 1860's during the French occupation of Mexico, purportedly found or acquired by Soldiers of Fortune, linked to Mayan sites in this country). "ET" is a smoky quartz skull found in the early 20th Century in Central America. It was given its nickname because its pointed cranium and exaggerated overbite make it look like the skull of an alien being. ET is part of the private collection of Joke VanDietan, who tours with her skulls to share the healing powers she believes they possess. I did scrying with ET at the Star Knowledge Conference, June 1996. These skulls are further examples of primitively sculpted skulls. They were discovered in the early 1900s in Guatemala and Mexico, respectively, and were brought to the U.S. by a Mayan priest in 1979. The two skulls are very alike. Like the Mitchell-Hedges skull, both of them were studied at Hewlett-Packard, and they too were found to be inexplicably cut against the axis of the crystal. Two of the best known crystal skulls - artefacts once thought to be the work of ancient American civilisations - are modern fakes, a scientific study shows. 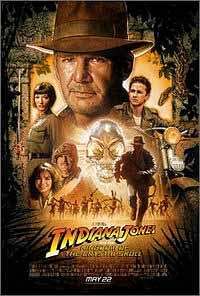 Crystal skulls are the focus of the story in the latest Indiana Jones film. But experts say examples held at the British Museum in London and the Smithsonian Institution in Washington DC are anything but genuine. 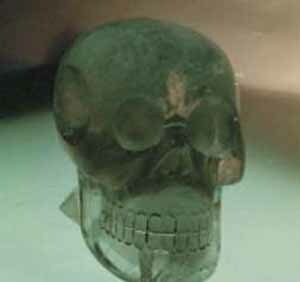 Their results show the skulls were made using tools not available to the ancient Aztecs or Mayans. Researchers say the work, which is published in the Journal of Archaeological Science, should end decades of speculation over the origins of these controversial objects. 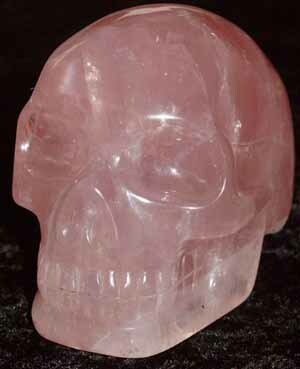 And it casts serious doubt over the authenticity of other crystal skulls held in collections around the world. A team including Margaret Sax, from the British Museum in London, and Professor Ian Freestone, from Cardiff University, used sophisticated techniques to work out how the two skulls had been made. 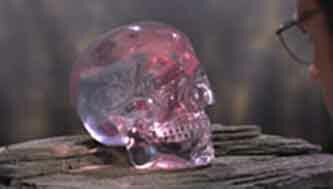 The concept of the crystal skull has been used in various works of fiction. Max McCoy's four Indiana Jones novels feature segments on Indy's search for a Crystal Skull. 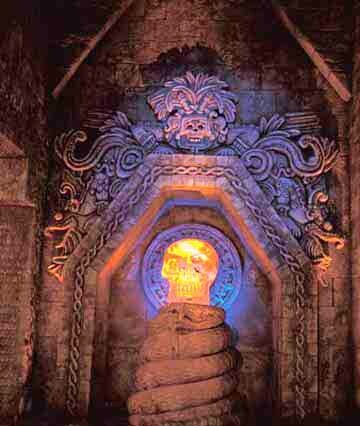 Episode 321 on the TV show, Stargate SG1 was called Crystal Skull. 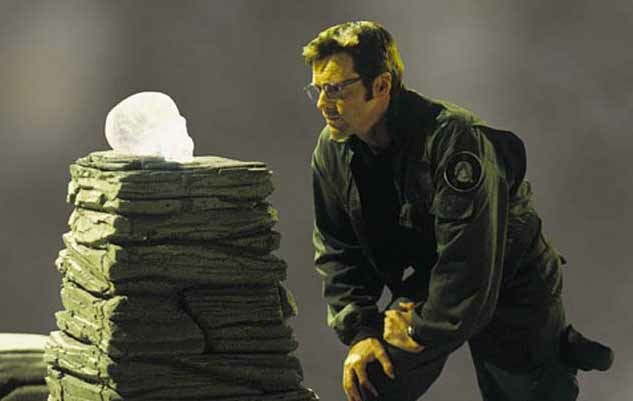 Dr. Daniel Jackson encounters an entity named Quetzalcoatl who is linked a mysterious crystal skull and time travel.